A community in Mexico is reeling after the deadliest pipeline explosion in recent memory claimed over a hundred lives and injured dozens more. At the end of last month, a pipeline located in a poverty-stricken region of the State of Hidalgo was sabotaged causing a massive explosion. The pipeline tampering was carried out by a gang of fuel thieves who drilled a series of holes in the hope of stealing fuel. Motivated by the possibility of reselling stolen fuel on the black market, roving gangs have been a thorn in the side of the Mexican energy economy for years. The sabotaged pipeline is owned by the government-controlled oil company, Petroleos Mexicanos, also known as Pemex, and connects to the Tula refinery located north of Mexico City. Illegal pipeline tampering, a dangerous, but lucrative criminal practice has been a persistent problem in Mexico. Historically, however, it was a relatively small issue, and both government authorities and energy companies had largely left the problem unaddressed. Energy companies had gotten used to writing off the thefts as business costs. However, the scope of the problem has worsened dramatically in recent years with fuel thefts rising at a dramatic rate. Last year, there were over 12,500 illegal taps, an increase of 27 times compared with the previous decade. Last year alone, the value of stolen fuel resold on the black market aggregated to over three billion USD. In response, the new President of Mexico Andres Manual Lopes Obrador has vowed swift justice. The government has implemented a plan of making strategic fuel diversions with the goal of eliminating transport through the most frequently targeted pipelines. However, this approach has manifested a serious downside. Diverting fuel away from certain pipelines means that a portion of the transport infrastructure is effectively underutilized. This means that the remaining portion of the infrastructure must compensate. Unfortunately for energy consumers, the logistics of the governments’ plan have not proceeded smoothly. The strategic underutilization has actually resulted in slower deliveries which has created fuel shortages. The lines at fuel pumps have multiplied in length. The practical effect of the governments’ plan is that the incentive to steal fuel has become stronger than ever. In addition to the diversionary scheme, the government has deployed 4,000 military personnel to address the problem. The President has also enacted an initiative to move the country away from a pipeline dependent transportation infrastructure. He has vowed to allocate government funding to increase the number of fuel delivery trucks by 25%. Currently, it is too early to tell what the long-term effectiveness of these measures will be. Part of the tragedy involving the Pemex line is fuel shortage related. The pipeline had actually been shut down as part of the government’s strategy to prevent theft. However, the pipeline had been reactivated mere hours before the tampering. Shortly after criminals breached the pipeline, hundreds of villagers from the nearby town of Tlahuelilpan, flocked to the scene, lured by the prospect of free gasoline in the midst of the shortage. Video taken right before the blast show the crowd of villagers, including whole families, flocking to the breach with containers of various kinds, hoping to collect some of the fuel. The government responded quickly, dispatching military units to control the crowd, but had limited success. Two hours after the breach was made, a spark or flame ignited the pressurized fuel, causing a catastrophic explosion. The resulting fire took four hours to extinguish. Investigators speculate that a spark generated by static electricity of clothing is what ignited the fuel. The initial blast left 79 dead and 81 injured. In the month since the incident, the death toll has risen to over 130, with more than a dozen still in critical condition. The staggering numbers quickly overwhelmed local emergency services, and many of the injured were transported to Galveston, Texas for treatment. The Pemex blast is the deadliest explosion in recent memory, surpassing the 2010 explosion in San Martin Texmelucan de Labastida, a city in the State of Puebla, which claimed almost 30 lives. The 2010 blast was also caused by pipeline tampering. In the United States, pipelines are actually considered a safer alternative to transporting volatile materials compared to trucks. In addition to being prone to leaks, trucks carry the risk of exposing combustible materials to vehicular collisions. However, the U.S. is largely free from the type of highly organized criminal elements that openly seek to undermine active pipelines in Mexico. What this explosion demonstrates is the extreme damage that a pipeline breach can create, regardless of the cause. Image Courtesy of Travel Notes. Though the prolonged government shutdown failed to produce the funding necessary to construct the entire border wall, a pre-existing allocation of $1.6 billion will fund 33-miles of border barrier, with a portion of the barrier built in Texas. Construction of the partial border barrier will be split between Federal and private lands. The pre-construction efforts of the Texas portion have given rise to an unusual opponent, the National Butterfly Center. The National Butterfly Center (“Center”) is a nonprofit organization which owns roughly 100 acres of land in the City of Mission in Hidalgo County, South Texas. It purchased the land to create a preservation corridor for endangered species. The Center’s land is adjacent to the US-Mexico Border and is home to as many as 200 different butterfly species that migrate through the area at various times of the year. It is also home to roughly 400 different bird species, and a variety of land animals. The center has a variety of hiking trails for visitor use. Maps produced by U.S. Customs and Border Protection place the wall on top of a pre-existing levee. As such, six miles of the wall will separate the Center’s land effectively slicing it into two distinct portions of 70-acres and 30-acres. The larger 70-acre portion of the property will be cut off from the rest of the center. In other words, 70% of the Center’s property will be behind the border wall. The latest design has the wall at 36 feet high, with an 18-foot concrete base augmented by 18 feet of steel bollards. The Center estimates that the government will bulldoze 200,000 square feet of land for the construction. The wall includes a 150-foot paved enforcement zone and will be fitted with cameras and flood lights. U.S. Customs and Border Protection and the Army Corps of Engineers have awarded a $145 million contract to SLSCO, a Galveston firm, to build the first installment. The Center predicts that the construction will vastly disrupt the operation of its conservation efforts. In addition to the gross reduction in conservation land, the Center believes the wall will harm land animals in particular, who depend on their ability to freely move around the acreage for foraging and reproduction. However, some avian species, including the Ferruginous Pygmy Owl that only flies 6 ft. in the air, will also be impacted by the wall. The Center also believes the wall will create a flooding hazard by reducing the ability of water to drain, which could reduce the lands viability as a habitat. It has also expressed concern that the wall’s flood lights will affect nocturnal animal’s day-night cycles. So far, the Center has been subjected to government surveyors who are measuring the land in preparation for construction. The Center was not given advance notice of workers entering the property, nor were they given notice that the contractors would begin cutting down trees. Though landowners do have protections regarding land seizures, Federal Law allows the Department of Homeland Security to bypass environmental restrictions. In fact, the current Administration waived the National Environmental Policy Act, the Endangered Species Act, and 26 other environmental statutes in order to expedite construction of the wall. Federal law also permits the Federal Government to take private property via eminent domain for public use. The resolution of these lawsuits can take years. Indeed, a number of eminent domain actions initiated by the Bush administration against private landowners for the first border wall project over a decade ago are still active. However, it should be pointed that the issue of possession, whether the government may be granted legal access to the property it seeks to acquire and begin construction, is typically resolved within a matter of weeks after the filing of the lawsuit. The continued existence of outstanding lawsuits is largely due to issues over the amount of compensation owed, not whether the project itself can be built. In many cases, the project’s construction is completed long before the compensation amount owed is resolved. The Center regards the possible use of eminent domain to build the wall as unconstitutional as well as contrary to its environmental aims and is determined to fight the government as long as they can. Because they are a non-profit organization, the Center has relied on volunteers and crowdfunding as a means to raise money for legal fees and have so far received ~$80,000 out of a target $100,000. The Center entered the legal battlefield against the Federal Government in December 2017 after contractors arrived on the Center’s property with chainsaws and heavy machinery. Over a year later, on February 12, 2019, the Center filed a restraining order against the Federal Government. On February 14, 2019, U.S. District Court Judge Richard Leon ruled against the National Butterfly Center and dismissed its suit against the Federal Government. This ruling effectively renders the Center’s request for a temporary restraining order moot. Judge Leon found that the due process rights of the Center were not violated by the Federal Government’s actions. Despite this major blow to the Center’s fight against the Federal Government, not all hope is lost. In the recently passed compromise spending bill, U.S. Representative Henry Cuellar added language protective of the Center. The compromise spending bill includes $1.375 billion for 55 miles of border wall but renders five cultural sites in the Rio Grande Valley “off limits” to construction of the border wall. These five cultural sites include the National Butterfly Center, the Bentsen-Rio Grande Valley State Park, the Santa Ana National Wildlife Refuge, La Lomita Catholic Church, and the tract of land soon to be home of the SpaceX commercial spaceport. Should President Trump sign the spending bill, the National Butterfly Center may be able to rest easy. Road construction in California. Photo courtesy of the Sacramento Bee. As we know, the private property rights in the United States, though extensive, are not absolute. Using the power of eminent domain, the government can forcibly seize private property for public purposes, if they provide the Constitutionally mandated compensation. Going a little deeper, it’s important to mention that there are three main sub-types of eminent domain. These are physical takings, regulatory takings, and inverse condemnation. In physical takings, the government performs some action that results in the occupation of private land. In regulatory takings, the government imposes a legal burden so expansive that it deprives the landowner the use of their property. An example might be environmental regulation that prohibits any kind of land developments. If the regulation deprives the land of all economically beneficial uses, it would essentially make the land worthless. Finally, inverse condemnation is a situation where a landowner has brought a claim against the government for compensation. In these cases, the landowner is alleging that government action has resulted in the taking of their land or has caused uncompensated property damage to occur. Approximately twenty years before the case, the land owner, Loren Prout, dedicated a small strip of land to the state. Briefly, dedication is the donation of private property for public use. This dedication went unaccepted by the government for approximately two decades. Then, in 2010, Caltrans began physically occupying the dedicated strip as part of its work to modify a highway. They did not compensate the landowner for this use. The landowner sued for inverse condemnation, arguing that Caltrans’ behavior amounted to a physical taking of his property. During its analysis of case documents, Caltrans discovered the twenty-year-old dedication, and argued that there was no taking because Prout had already dedicated the land to the government. Prout countered by pointing out that the government had failed to formally accept the dedication, even though the dedication was offered two decades ago. The Court held against the landowner on two counts. First, it decided that the government had accepted the dedication by implication. The basis for the implied acceptance was the fact that Caltrans began using the land for its construction process. Second, the Court held that Prout had failed to voice his grievances with the terms of the dedication in a timely manner. The Court pointed out that Prout could’ve objected to the dedication before the onset of this case but failed to do so. Therefore, the Court held for the government. The case is a lesson for both governments and private property owners on the importance of timeliness in the legal process. Though two decades seems like a generous period, neither the government nor the land owner managed to act in their own interest within that time. If they had, the outcome of the case might very well have been different, particularly from the landowner’s perspective. In fairness to the landowner, knowledge on matters of legal timing, particularly as it concerns niche real estate issues such as dedication, are not common knowledge. Landowners may wish to be conscientious about obtaining qualified legal advice if they have uncertainty, particularly when the government’s ability to occupy their land is at stake. Living in the Shadows: No Compensation for Property Owners Next to Powerlines, Justin Hodge Quoted in Houston Chronicle. Residents of Silverlake, a subdivision of Pearland, are rightfully outraged at CenterPoint Energy for a construction project that will impose high-voltage electrical towers on their previously clear skyline. CenterPoint’s project will span for 3-miles and is part of a 14-mile transmission project that will result in a string of immense steel electrical towers stretching from Pearland to Friendswood. Homeowners were attracted to the area not only by quality schools, but also by Silverlake’s underground electrical system, which they viewed as having great aesthetic and safety benefits. Now they are worried, not only about the declining value of their property, but the dangers of living near high-voltage towers. Many families have young children, who may not understand the warning signs that caution passerby about the presence of high voltage electricity. Additionally, the presence of towers creates a risk of catastrophe during hurricane season. A particularly powerful wind could knock the towers over. 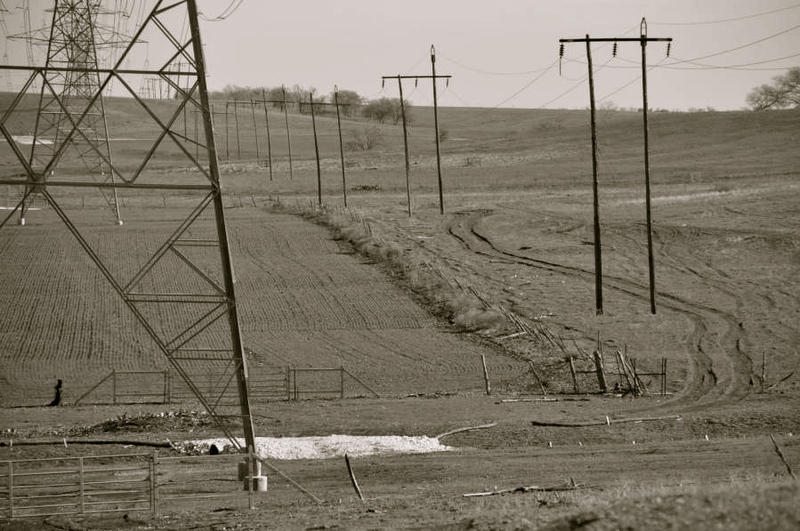 In another point against landowners, Texas law does not require utilities to notify landowners if the carrying capacity of the powerlines do not exceed 230 kilovolts. Silverlake residents therefore had no warning about the impending construction. This type of story is not unique in Texas. Indeed, pipeline builders, utility companies, and the State’s transportation department have a long history of conflict with landowners whose properties they have seized and damaged via eminent domain for various construction projects. What separates the residents of Silverlake from those other cases, is that this time, no compensation will be paid to the landowners. The reason for the lack of compensation is that in the view of the existing law, no taking has technically occurred. Texas law permits private entities such as pipeline and utility companies to seize property through eminent domain. Both the U.S. Constitution and the Texas Constitution state that a condemnor must pay the landowner just compensation. However, the condemnor is not required to compensate landowners whose properties merely abut the taken land. Further, condemnors are not required to compensate the broader community for any damages that the taking may have caused. This is made possible by a Texas Supreme Court decision which held that businesses damaged by a highway widening were ineligible for compensation even though eminent domain was used. Development of the Silverlake residential community began in the 1950s. It was also around that time that an 80-foot easement for powerline construction was created. Because CenterPoint would owe Silverlake residents compensation if their electrical towers were to intrude on their land, the company has found a way to fit its construction wholly within the 80-foot easement width. What’s worse is that the easement follows a path through the center of the Silverlake community, and even cuts across the local golf course. This means that when CenterPoint is finished building, homeowners will be forced to live in the shadows of massive high voltage utility lines. The unluckiest residents will have towers located as few as fifty feet from their homes. Landowners believe that, contrary to the current legal treatment, the mere proximity of the towers has damaged the value of their land. Silverlake residents looking to sell their properties have already had to lower their prices to attract buyers, who find the prospect of living near powerlines distasteful. The plight of Silverlake residents has been reported in the Houston Chronicle. Justin Hodge, an eminent domain attorney who represents landowners, argues that abutting landowners are indeed damaged by such construction projects. He hopes that the Texas Legislature will do something to help landowners in this predicament during the 2019 legislative session, but lawmakers in the past have rejected these proposals. The full article appearing in the Houston Chronicle can be found here. Courtesy of Houston Business Journal. In response to landowner requests, a handful of Texas politicians are looking for ways to increase the State’s control over Texas Central’s planned Houston to Dallas high-speed rail project (“HSR”). These landowners, who own property in the path of the proposed train, are motivated primarily by their concerns that Texas Central will use the power of eminent domain power to seize their land. They also hope that an increase in government oversight will provide a greater measure of transparency and accountability. Though landowner response to the project is mixed, the general tilt is negative. Admittedly, there are a few landowners who are happy for the opportunity to sell their land. Because the HSR’s route was designed to parallel existing high voltage utilities, its proposed path closely follows existing electrical power transmission corridors. Several of the properties along the route are therefore already encumbered by multiple electrical towers. These installations dramatically lower the land’s value, making it unattractive to buyers. Owners of these parcels are all too happy to take what little Texas Central will give them. The remaining landowners, however, are not so happy. So far, Texas Central has reportedly acquired ~30% of the necessary land through voluntary sale. Many of the remaining parcels are owned by hold outs who refuse to part with their land for any price. Most of these holdouts are ranchers and farmers, who make their living off the land, land which has been passed down from generation to generation. The historical and sentimental value of the property, therefore, cannot be measured in currency. Attachments can run deep; several of the landowners even have family burial sites on the land. Texas Central has publicly expressed a desire to avoid using eminent domain, and so far, it has been successful. Indeed, a question still exists as to whether the eminent domain power is even available to them. One court in Harris county has said yes, but landowners and their attorneys remain unconvinced, and are committed to disputing that finding in other counties. One semi-recent Texas legislative story is partially responsible for this ambiguity. In 1989, the State legislature established the Texas High-Speed Rail Authority (“Authority”). This agency was responsible for exploring the possibility of bringing a high-speed rail to Texas and finding a contractor to build it. The Authority also had the power to exercise eminent domain if it could show that the use of eminent domain was in the public interest. After a research period, the Authority granted a contract to the Texas TGV Consortium, which was tasked with building and operating a high-speed rail in Texas. However, the plan fell through for financial reasons and in 1994, the Authority was abolished by the legislature. The termination of the Authority created a regulatory vacuum regarding the issue of eminent domain use for high-speed rail that endures to this day. More recent attempts to effect regulatory change in the legislature have failed. As of 2017, 20 proposed bills regarding the HSR have failed to pass. Despite the legislature’s somewhat unhelpful history on the issue, landowners who wish to see State involvement materialize have reason to hope. A handful of Texas politicians are of the opinion that a formalized State oversight mechanism could be of great benefit for landowner interests. For example, Representative Ben Leman, a Republican from Anderson, believes that a state agency of some kind will add clarity and equity to the eminent domain process. Representative Cecil Bell, Jr., the vice chair of the House Committee on Land and Resource Management is likewise of the opinion that oversight could benefit landowners, though he has stated that the solution might be to task an existing agency with oversight, rather than establish a new office. Whatever the legislative outcomes, affected landowners are encouraged to stay current on all developments regarding this project. If eminent domain is used, property owners who find themselves in the crosshairs of Texas Central are reminded that the U.S. Constitution and Texas Constitution both state that compensation must be paid to the property owner if land is forcibly seized via eminent domain. Landowners are further reminded that they can dispute a condemning authority’s offer via the courts, and are encouraged to seek counsel at the appropriate time.